This also comes from the book Living Sober. Here’s an old saying that has special, strong meaning for us. Simply stated, it is this: Above all other concerns, we must remember that we cannot drink. Not drinking is the first order of business for us, anywhere, any time, under any circumstances. This is strictly a matter of survival for us. We have learned that alcoholism is a killer disease, leading to death in a large number of ways. We prefer not to activate that disease by risking a drink. Treatment of our condition, as the American Medical Association has noted, “primarily involves not taking a drink.” Our experience reinforces that prescription for therapy. In practical, day-by-day matters, this means we must take whatever steps are necessary, at whatever inconvenience, not to drink. When we view alcoholism as the life-or-death matter it is, the answer is plain. If we do not save our health—our lives—then certainly we will have no family, no job, and no friends. If we value family, job, and friends, we must first save our own lives in order to cherish all three. 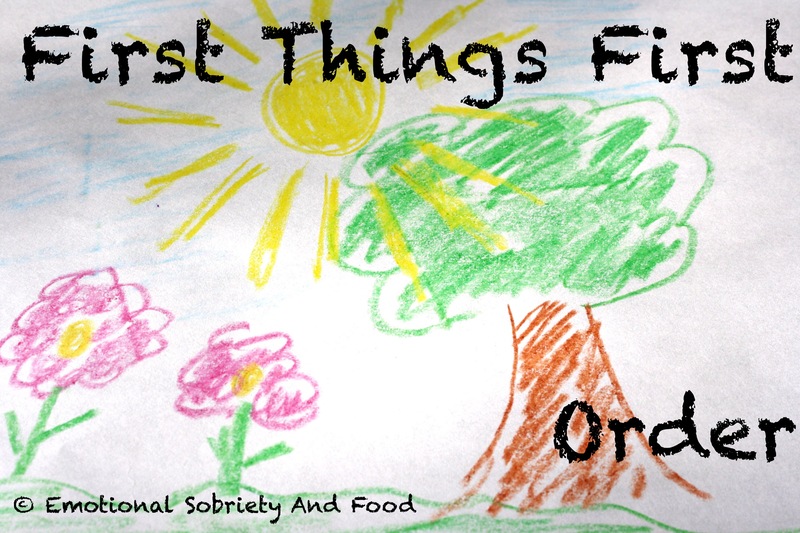 “First Things First” is rich in other meanings, too, which can be significant in combating our drinking problem. For instance, many of us have noticed that when we first stopped drinking, it seemed to take us longer to make up our minds than we liked. Decisions seemed to come hard—on again, then off again. Now, indecisiveness is certainly not limited to recovering alcoholics, but perhaps it bothered us more than it would others. The newly sober homemaker could not figure out which of many cleanup jobs to do first. The businessman couldn’t decide whether to return those phone calls or dictate those letters. In many departments of our lives, we wanted to catch up on all the tasks and obligations we had been neglecting. Obviously, we couldn’t take care of them all at once. So “First Things First” helped. If any of the choices before us involved drinking or not drinking, that decision deserved and got priority. Unless we held on to our sobriety, we knew, no cleaning would get done, no calls made, no letters written. Then we used the same slogan in ordering our newfound sober time. We tried planning the day’s activities, arranging our tasks in order of importance, and never making the schedule too tight. We kept in mind another “first,” our general health, because we knew that getting overtired or skipping meals could be dangerous.